The latest industry to benefit from drones is logistics and commerce. In cases where urgent express shipments are required, for example in crowded cities or in rural areas lacking in adequate infrastructures, drone delivery could provide the ideal solution. In recent years we’ve witnessed rapid urbanisation in many areas, and this trend is set to continue into the future. The result of this rapid urbanisation is increased pollution, congested roads, and decreased efficiency which is mainly caused by delays in the flow of people and goods. Urban first and last mile delivery is a major part of the problem; as online shopping increases, so does demand for this service. The scenario: a long-haul delivery arrives from outside the city and is sorted at a warehouse, being separated automatically according to certain criteria, drones then collect packages from the conveyer belts for delivery. A smartphone app and GPS allows the customer to place orders and track their delivery. Another scenario: the WALKER sits on top of a delivery truck, awaiting a parcel from the driver; the barcode on the parcel is scanned by the drone, it then uses GPS to fly to the destination. Afterwards, the drone hooks up with the truck, recharges its batteries, and gets ready for its next delivery run. Manage for a fleet, not a flight: It’s important to understand that the actual number of UAVs required will vary according to the situation. Enterprises should aim to acquire and manage a fleet of delivery drones suitable for different purposes to enhance business operations. Plan global, think local: Enterprises should prepare for global deployments, but they will also need to adjust their plans to accommodate local guidelines and regulations, which vary significantly based on local jurisdiction. Design for data collection and analysis: Sensor data collected by UAVs can help to guide work processes and generate insight, and can be used for preventive and predictive maintenance, and operational intelligence. Companies will need a drone platform equipped to capture, process, and analyse data. Change how work is done: We recommend that companies view drones as an active part of the business process. The role of existing employees may change as drones become ‘digital workers’, freeing up humans for other roles within the business. 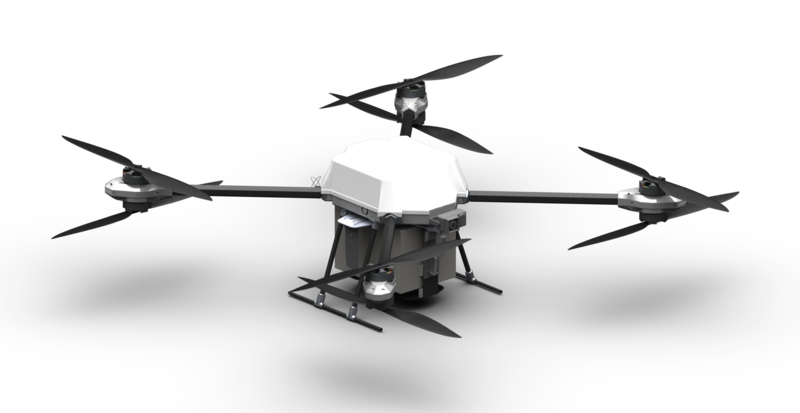 Airborne Drones are able to provide your logistics manager with a complete airborne UAV platform, which enables remote sensing and records geo-referenced data types. Airborne Drones focus on the design, manufacture, and marketing of long-range drones, typically 10km, 20km and 35km, which can carry payloads of up to 8kgs, and are for industrial strength commercial use. Long-range delivery drones have the potential to offer huge benefits for commerce and business. Solutions can be developed to meet your specific requirements, and our services can include support and training during implementation, as well as post implementation. Airborne Drones services an international base of clients ranging from South Africa to the UAE. Clients include representatives from the following industries: Marketing, Real Estate, Security, Agriculture, Game farms, Wildlife management, Electrical installations, Telecommunications, Travel and tourism, Sheet metal manufacturing, Satellite electronics, Wind farms, Industrial Rope Access, Restaurant and Food, Environmental Affairs and Military Applications.